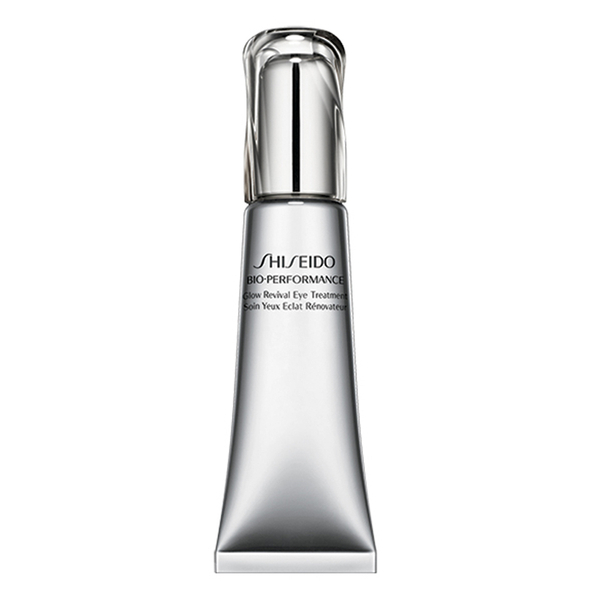 Transform the delicate eye area with Shiseido's Bio-Performance Glow Revival Eye Treatment; a skin-perfecting cream that delivers multiple benefits, including diminishing dark circles, minimising the look of fine lines and wrinkles, and improving the skin's overall appearance. 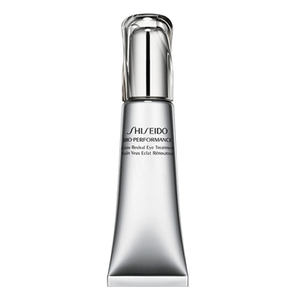 Fortified with Multi-Capisolve 1124™, the rich, anti-ageing formula absorbs quickly to regenerate, repair and enhance vital nutrient flow to the eye area, whilst the brand's innovative RenoCycle System technology promotes cell renewal and improves resilience to leave you with smoother, refined skin. Featuring a unique Kassa massage applicator to maximise results, the hydrating treatment contains Coix Seed Extract to eliminate puffiness, and a dose of Vitamin C to brighten, soften and combat uneven skin tone around the eyes. Suitable for all ages and skin types. Use every morning and evening after your day and night cream. Dispense a small pearl sized drop onto the back of the hand and apply gently around the eye area with your ring finger. To enhance the product’s benefits, use the Kassa applicator to massage gently under and over the eye bone. Water, Glycerin, Dipropylene Glycol, Dimethicone, Butylene Glycol, Sd Alcohol 40-B (Alcohol Denat. ), Methyl Gluceth-10, Myristyl Myristate, Petrolatum, Hydrogenated Polydecene, Behenyl Alcohol, Stearyl Alcohol, Glyceryl Stearate Se, Cetyl Ethylhexanoate, Peg/Ppg-14/7 Dimethyl Ether, Dimethicone Crosspolymer, Polysorbate 60, Peg-40 Stearate, Sodium Acrylate/Sodium Acryloyldimethyl Taurate Copolymer, Phenoxyethanol, Mica, Isohexadecane, Titanium Dioxide (Ci 77891), Polyvinyl Alcohol, Polysorbate 80, Sorbitan Tristearate, Tocopheryl Acetate, Caffeine, Sodium Citrate, Fragrance (Parfum), 2-O-Ethyl Ascorbic Acid, Sorbitan Oleate, Disodium Edta, Xanthan Gum, Alcohol, Limonene, Citric Acid, Sodium Metaphosphate, Xylitol, Oryzanol, Magnesium Ascorbyl Phosphate, Hexyl Cinnamal, Benzyl Benzoate, Butylphenyl Methylpropional, Linalool, Sodium Metabisulfite, Sodium Acetylated Hyaluronate, Iron Oxides (Ci 77491), Alpha-Isomethyl Ionone, Saccharomyces Ferment Lysate Filtrate, Crataegus Monogyna Flower Extract, Citronellol, Geraniol, Dipotassium Glycyrrhizate, Paeonia Suffruticosa Root Extract, Tocopherol, Rehmannia Chinensis Root Extract, Cinnamomum Cassia Bark Extract, Bupleurum Falcatum Root Extract, Coix Lacryma-Jobi Ma-Yuen Seed Extract, Camellia Sinensis Leaf Extract.